The creative Harmony House Soup Mixes are the starting point for our popular and timeless Gourmet Soup Blends, and now they are available to you! 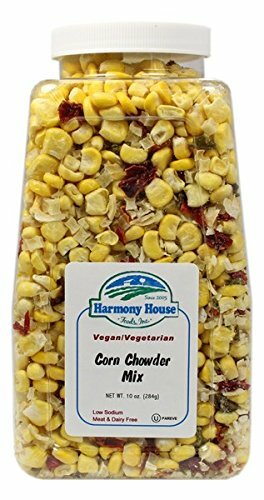 The Corn Chowder Mix is the base for our Creamy Good Corn Chowder Blend, but without the added salt and seasonings! This mix starts with premium Non-GMO Freeze Dried Corn, and then adds creamy white potatoes, colorful red and green bell peppers, and sweet onions! This succulent blend not only tastes delicious, but it also contains 35% of the RDA for Vitamin C in every serving. Make sure to always have a Jar in the Pantry for when company comes over. Gluten Free, Vegan Vegetarian, OU Kosher.